Spiders are the one animal that you can’t avoid in life, so having a fear of them can be very debilitating. The fear of spiders is one of the most if not THE most common phobias in the world. Arachnophobia is said to affect around 11 million people in the UK and 10-12% of the people in the United States. Many people think because of this that it is something we are all born with but only the fear of falling and the fear of loud noises are fears we are actually born with. Everything else is learned, including the fear of spiders. Why then, are so many people afraid of spiders? Most likely their quick and unpredictable movements create the fear trigger that can develop into a phobia at a young age. Since our primitive cavemen days, we had an instinct to quickly learn to react with a fight or flight response to anything that could be a potential danger and that included anything quick and unpredictable. In our modern day times, this isn’t so useful, as most spiders are not a threat at all and actually doing a lot to help us. Plus, having so much anxiety over an animal that can literally appear anytime and anyplace is a very inconvenient phobia! People with arachnophobia can have massive panic attacks with symptoms of a racing heart, cold sweats, nausea, dizziness, clenching, fainting, etc. For many, these sort of reactions can happen at just looking at a picture of a spider. It is a lot of subconscious anxiety for a person to deal with. People can also limit their quality of life because of their fear of spiders. They might never travel to certain destinations and miss seeing family or going on an adventure. We have heard of people ruining dates, interviews and not being able to sleep in their own beds because of a spider. It can even be dangerous as there have been many stories of people almost crashing their cars because of a spider dropping down from the sun visor. It is a phobia that really has to be treated! The Spider Courage Experience offers a holistic and multi-faceted approach to spider phobia therapy. Many therapy providers fall short of their objectives due to their limited approaches and the eventual cost of therapy can become prohibitive. Not all forms of therapy work on all people and there are no “one size fits all” solution. Different people will resonate with different types of treatments so that is why Creature Courage uniquely combines cognitive therapy, NLP techniques, hypnotherapy, education, art therapy and an option of immersive therapy, in one cost-effective session to ensure a higher success rate. 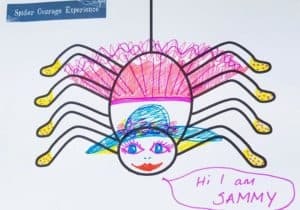 Hundreds of lives have been changed using this unique combination of techniques on the Spider Courage Experience workshops. The Spider Courage Experience also has the benefit of teaching self-calming skills that can be easily applied to any stressful situation one may face in life, beyond the arachnophobia. The power of the small group atmosphere is also highly effective in motivating people to change and to feel more supported. Not only this, but all the techniques are done in a creatively engaging way so losing your fear has never been more entertaining!